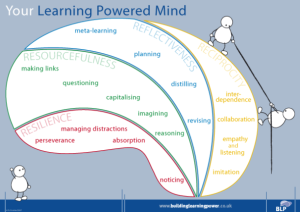 Promote a learning culture that encourages children to become more effective learners, by developing ‘learning powers’ that will help them to take the next steps on their learning journeys. Allow children to approach difficulties in learning without fear of failure. Develop children’s confidence and self-esteem as successful learners. 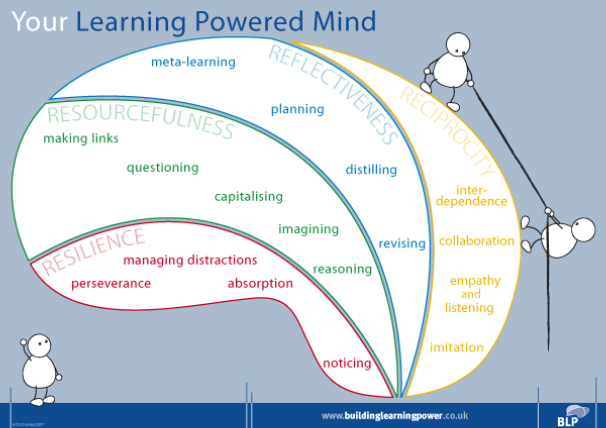 Each term we focus on a different learning Power. Year 6 launch the work with a special assembly, introducing heroes to the rest of the school and each class participates in a learning power activities afternoon. Displays in each classroom, assemblies featuring learning power heroes and heroines and ‘learning power’ awards are all help to promote the ideas.Have a look at our class news pages to see how we have been learning more about Learning Powers. During the first term, we focussed on the learning power of Resourcefulness: being ready, willing and able to use a range of learning strategies and ‘knowing what to do when you don’t know what to do. The following term we focussed on the learning power of Resilience: ‘he ability to cope with and rise to the inevitable challenges, problems and set-backs you meet in the course of your life, and come back stronger from them. Key idea: We can learn by not giving up even when we find things hard. We should keep trying! During the third term we focussed on Reflectiveness: thinking about or reflecting on what you do. It is closely linked to the concept of learning from experience, in that you think about what you did, and what happened, and decide from that what you would do differently next time. Reflective practice requires a conscious effort to think about events, and develop insights into them. Key idea: We can learn by thinking carefully about our own experiences, in order to improve the way we learn. Finally we are learning about Reciprocity: Being ready, willing and able to work well with others; developing and using good relationships to help your own learning. Know when to work alone and when to work with others. Encourage children to develop a ‘growth mindset’ by praising the effort that they have made to achieve goals, rather than talent e.g. ‘I like the resourceful way that you went to find a dictionary to help you to spell words- well done!’ rather than ‘Great spelling!’. View mistakes as a learning opportunity. Teach children how to visualise not just the achievement of a goal but the steps needed to get there.